Thinking of buying an Estepona property on the Costa del sol in Spain? Before I start if you have anything to tell about Estepona, have some nice photographs, (a webcam live view - would be nice!) or would like to tell us your story, write here! Well lets start! Here you can find out what Estepona has to offer and if the area is suitable for you, before you make any decisions to move there. Map of the location of Estepona. Google earth image of Estepona. Arriving by car; including recommendation for the best rent a car agency. Arriving by train; including times and prices. Arriving by bus; including times and prices. Arriving by taxi; including laws regarding passengers, location of taxi stand and prices. Look for books about Estepona at Amazon's online shop. Things to do in Estepona. Local market days in Estepona. Contact us if you have anything to add about Estepona. Click here to see the location of Estepona on the Via Michelin map. Estepona is probably the cheapest and less developed area to buy a property on the Costa del Sol. Though thousands of properties are currently under construction, Estepona is still a Spanish-orientated place without the enormous amounts of tourists and foreign property owners that can be found in most other places on the Costa del Sol. If you want to take advantage of the current property-boom in Estepona, be quick! This is the moment to jump in! Most sought after resort in the Estepona area: Sotogrande. The whole area of Estepona has 51.000 inhabitants and is situated on the west-side of San Pedro. It has easy access via the motorway making travel easy to anywhere on the Costa del Sol. Malaga's international airport is an hour away and Gibraltar can be reached in less than thirty minutes. The coastline of Estepona is more than 20 kilometres long and all sorts of watersports can be practiced. The main sources of wealth have traditionally been agriculture, fishing and cattle farming. These activities have maintained their importance so far but undoubtedly tourism is now the major factor that drives local economy. A wonderful climate, well looked after beach resorts and a wide range of attractions including golf courses, ports and excellent restaurants and bars are just some of the reasons why thousands of tourists choose Estepona as their holiday destination or as their second home in Spain. Sports are easily mixed with the Estepona lifestyle. For starters, there are almost ten golf courses within the Estepona area. Estepona property owners and Estepona golf lovers view the Costa del Sol as an international meeting point. The fantastic spring weather all year round, the variety of accommodation and amenities available, together with the quality of the many golf courses, convert the Costa del Sol into the Costa del golf. See our property golf course page. Download google earth for free. Click on the image. You will have no trouble getting to your Estepona property by car, as Málaga airport is linked with the city and the rest of the towns on the Costa del Sol via the E-15 and the N-340 motorways. We do however suggest that you buy a good map! One of the most globally recognised travel brands, Hertz is the world's largest and longest established vehicle rental. A pioneer in car rental, Hertz invented the fly-drive concept and many initiatives since. As testimony of its dedication to service, Hertz has won numerous awards around the world over the past, including the prestigious 2005 Readers Digest Award for most Trusted Car Hire brand in the UK. Access to over 7400 locations in 154 countries, including all major cities and airports. Wide range of the latest models from the world's leading manufacturers. Flexible booking features such as one-way rentals. Inclusive rates with unlimited mileage. Driving direction mapping on website. Unique NeverLost® Satellite Navigation System. Specially equipped vehicles in winter. Instant Return services at many locations. 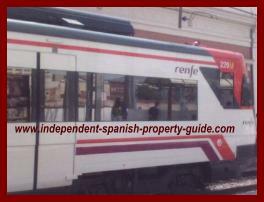 We do not recommend taking the train to your Estepona property. The train tracks stop at Fuengirola, so you would have to continue your journey by bus, train or taxi. There is no direct bus to Estepona. You must take two. To get to your Estepona property by bus, you must first take the Marbella-Airport line, and then from the Marbella Station, take the number 27 bus to Estepona. Bus-stops can be found at the Terminal 1 arrivals and Terminal 2, departures. Timetable: 06:15, 8.00, 10.00, 12.00, 13.45, 15.45, 17.30, 19.30, 21.30, 23.00. The journey takes approximately 45 minutes. Price: 3,92 €. This information is provided in good faith, but do not plan your journey around this timetable without checking the official bus website for exact times and prices before you travel! For more information you can telephone: 902 143 144 or look at the updated timetable and prices on the bus website. 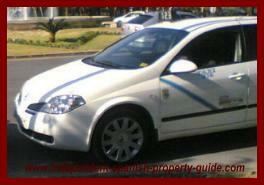 There are taxis right outside the door of the airport, ready to take you to your Estepona property. This is by far the most comfortable option.The prices are divided into two categories. Work days between 6am and 10pm: approximately 0,9 Euros for every kilometre. Between 10 pm and 6am, Saturdays, Sundays and bank holidays, the whole day; approximately 1,01 Euros every kilometre. A taxi should cost you approximately 80 Euros depending on the category and the exact area within Estepona. A taxi carries four passengers. Babies must use their own security baby chair, small children under 135cm. must use their own booster seat, and children under 140 cm must not sit in the front. Most Spanish taxi drivers will allow children without their own security chair, because if the police stop you on your journey, you pay the fine, not him! If you want a book a taxi online with a private taxi company, click here. Photographs provided by the Estepona town hall. This information is taken from the Spanish yellow pages. If you see a listing of 159 restaurants, at least you will have an idea of the size of the town, you are thinking of buying a property in, where as if you see a listing of two, think about buying some hens, as your Estepona property will be in a very remote place! 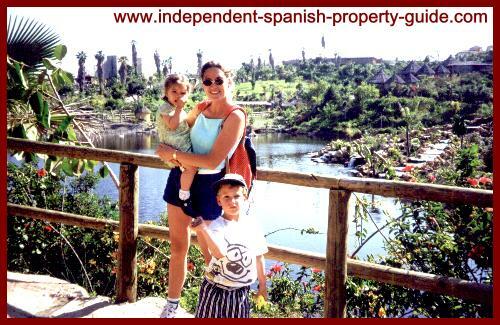 * There is a fantastic adventure safari park called Selwo Aventura in Estepona. You'll see elephants, lions, wolves, bison, camels, ostriches, hippopotami and hundreds of other animals gathered together from all five continents. Explore this 100 hectar park along routes through valleys on foot and in four-wheel-drive vehicles. Experience three different zones that reproduce the habitats these animals come from with all your senses on the alert! To get here, drive along the Costa del Sol motorway and turn off at the exit marked Km 162.5. *Daytrip to Gibraltar. Visit 'the rock' to see the monkeys, caves, siege tunnels and old-fashioned English bobbies! Don´t forget to buy your duty free goods! Costa del Sol: Sotogrande, Marbella, San Pedro, Gaucín, Estepona. Canon Michael Fisher, tel. 952 808 605. Marbella/San Pedro/Estepona: Capilla de la Inmaculada (The White Chapel), Guadalmina (Baja). Parish Communion 1st & 3rd Sundays, Morning Prayer 2nd & 4th Sundays, 11.30 a.m.
Sotogrande: Old School Chapel near Paniagua: 2nd and 4th Sundays, Parish communion 11.30 a.m (1st & 3rd Sundays, see Methodist services). Sunday services 11 a.m. and 7 p.m.
Midweek Fellowships. Telephone (9567) 77491/408 for details. Reverend Wilf Pearce. Assistant Reverend Fidel Patron. Carpenters’ Arms Café Mon-Fri, 09.30 - 14.00. Sotogrande: Old School Chapel near Paniagua, first and third Sundays 11.30a.m., contact churchwarden Telephone: (9567) 95062. La Línea: Asambleas de Dios. C/San José, 41. Every Thursday at 9 p.m. Sundays at 11 a.m. & 8 p.m.
Tuesday Bible Study 6 p.m.
Thursday Prayer Meeting 6 p.m.
Gibraltar: St. Andrew’s Church, Governor’s Parade. Worship and Sunday School 10.30 a.m.
Bible Study - Tuesdays 7.30 p.m.
La Línea de la Concepción: Calle Isabel la Católica Number 43. Suite 21a, Don House, 30-38 Main Street. Gibraltar: For meetings phone contacts on (9567) 43637 or (9567) 73287. If you have anything else about Estepona to add to this page, (a webcam would be nice!) or would like to tell us your story , write ahead!